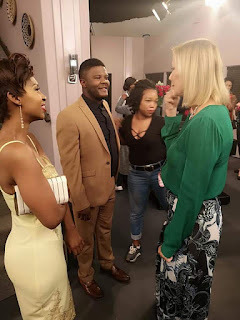 American actress Katherine Kelly Lang(Brooke Logan) has been featured in two episodes on Isidingo that will be aired on 5 and 6 of September 2018. Katherine's appearance on Isidingo is part of the 20-year celebration of story telling and keeping the audience glued to their screens. While enjoying her stay in Mzansi, the actress participated in the Iron Man challenge in Port Elizabeth on Saturday and Sunday. She also attended a few shows hosted by the SABC. Menlyn Mall in Pretoria at 11: on Wednesday, September 5. Maponya Mall in Soweto at 14:00 on Wednesday, September 5. The 57-year-old landed in South Africa on Monday, 27 August and she has received a warm welcome from her South African fans.